BAJA INDUSTRY PROFILE: Turn Your Home & Garden Into Paradise! 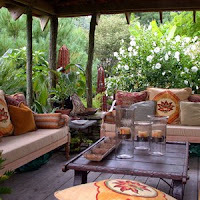 Your home and garden are the embodiment of your paradise . . . the space where you spend most of your time in Baja . . . the space that is especially important to you. Turning your home and garden into the paradise of your dreams can be both invigorating and relaxing; however, sometimes even the "handyman" in all of us needs a little help. A vast peninsula extending some 1,250 km (775 miles), Baja has two time zones, the Pacific Ocean and the Gulf of California (or "Sea of Cortez"), four main desert areas, the Tropic of Cancer . . . and that only includes the "Garden" half of the equation. Baja is also home to fine artists, craft workers, and professionals known for their knowledge and abilities to build, create or construct products with high degrees of excellence, to help turn your dreams into reality. Baja's diverse professionals provide you with as many quality choices as this vast peninsula does in geography and life. From turning that boring backyard into an outdoor oasis to making your bedroom an island paradise, when creating your space, look to the businesses and artists in your Baja community. Whether your paradise is tropical or desert, seaside or mountains, Gulf or Pacific, you will find professionals with a unique gift, product or service that will help you turn your space into a Shangri-la! Need Improvements to your electrical, plumbing or gas system installations? Call Baja Home Improvement Services! Since 2006, they have provided professional and courteous service to their many customers, and provide FREE estimates. They have recently added more products to their diversified offerings: instant hot water heaters, window treatments, Johnson solar window film to protect your assets and save energy costs, made in the USA Classic Retractable screen doors—enjoy the sea breeze without the annoyance of pesky flies—and, coming soon, custom-made wood shutters. Baja Home Improvements takes pride in all they do, completing all they start. Give them a try, you'll be glad you did! Call (686) 222-4507 for a consultation today. San Felipe Interior Design has existed and been a part of San Felipe Home Builders since its inception, but available only to their custom-home clients. They are now offering their design services to the public. You can now get the service you expect with the advantage of having access to local artisans and suppliers that have a proven track record. They will help you with your dreams and ideas, with no sales pressure. They are not in the business of selling you products and services, they are here to help you achieve the look and feel you want, and also give you the advantage of buying through the network they've developed through their years of building in San Felipe as well as California. They offer the services of the best Faux Finish painter in all of Northwest Mexico. Martin has done faux work in some of the richest homes in Baja, as well as Sonora and Sinaloa. He has been in the San Felipe area for the last five years and they feel privileged to have him working with their team. Imagine a mural over your stove, fireplace or on a wall as you enter your home. In addition to custom murals, they have custom doors and quality door hardware from all around the world, as well as window coverings from the U.S. and Mexico, all types of cabinets and accessories with over 100 door styles and finishes that can be imported for less than custom cabinets in the U.S. Cabinetry is imported from Hertco Manufacturing in Washington with different price levels to suit your budget. Contact them for a consultation at (686) 577-3176 or, if calling from the U.S., (619) 200-6456.